Dentures require care just like regular teeth. While these dental devices are certainly strong, they are also susceptible to damage. 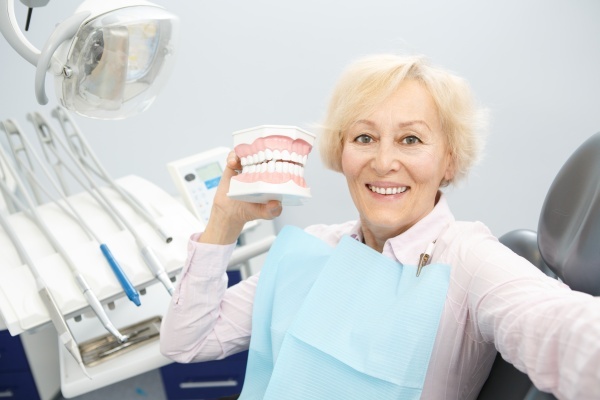 If you have dentures, a proper cleaning will help extend their lifespan in the years to come. Follow these denture care tips to extend their lifespan and beauty. Do not place dentures in water any warmer than room temperature. Exposure to water at a particularly high temperature will cause your dentures to warp, become misshapen and possibly even spur the need for replacement. It is important to keep dentures moist. The failure to keep dentures moist will cause them to dry out. Dry dentures lose their shape. Thus, it is crucial to be sure to soak your dentures every single night. Use a denture cleanser or water for soaking. Ask us for more information on this process during an appointment. Use the right adhesive to connect your dentures to your gums. Failure to create a firm seal will allow small bits of food to stick in gaps and cause bad breath. Keep in mind the use of dentures has the potential to reduce your mouth's production of the all-important saliva. Saliva is necessary for the moisture that keeps your breath smelling nice and fresh. By selecting the right adhesive, you will improve the natural cleansing ability of your saliva. Furthermore, some denture adhesives have antibacterial qualities that improve the quality of breath. Regular check-ups are necessary to ensure your dentures remain in tip-top shape. The dentist will inspect the dentures as well as your oral tissues. In particular, the areas by your gums are especially important. Those who use dentures have a disproportionately high risk for gum disease. Aside from checking for gum problems, the dentist will also inspect your mouth for signs of oral cancer. Dentures are just as sensitive as regular teeth. Do not use a toothbrush with hard bristles when cleaning your dentures. Opt for a toothbrush with soft bristles and gently brush the dentures to eliminate bacteria, food particles and other gunk. Rinse your dentures with warm water following the consumption of food. Make sure enough water moves over your dentures to wash off all the bits of food. If food remains in place, your dentures will decompose and make your breath smell terrible. As noted above, denture adhesives form the tight grip that serves as a barrier between the gums and the pressure of the dentures. Such adhesives are essential for lower dentures. You will be tempted to apply an abundance of adhesive with the hope of maintaining a tight grip. However, adding excess denture adhesive will not improve the fit. If you have concerns about the fit of your dentures, contact our dentist for assistance. For more information or to schedule an appointment with Impressions Dental, request an appointment in our Chandler dental office here: https://impressionsdental.com. Or call us at (480) 814-8888.